As blinding concrete is poured in the background, an excavator is at work on an 8 x 7-metre gallery. 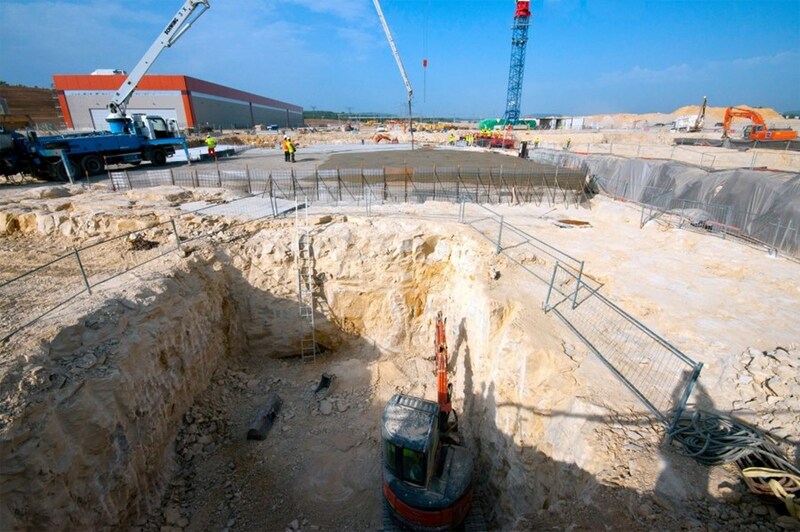 Work kept progressing on the ITER platform during the summer recess. Blinding concrete was poured over the rock surface of the future Assembly Hall adjacent to the Tokamak Seismic Pit. The resulting clean and flat 6,000 m² surface will be used as a working platform to install the reinforcement steel of the building's structural foundation. In parallel, workers finalized rock excavation for the galleries that will run in the foundations. In the picture, an excavator is at work on an 8 x 7 metre gallery that will serve as an entry point for most of the electrical cables providing energy to the tools and devices to be used for assembly operations. Work began on the networks of Contractor Area #2 and continued throughout the platform as manholes connecting the large 1.6-kilometre-long concrete piping of the underground drainage network were installed. Foundation work on the Assembly Hall worksite will extend into March 2013, and drainage network installation should be completed by November of this year.